Arctic Root® contains the proprietary SHR-5 extract derived from the highest quality Rhodiola rosea root. SHR-5 has been clinically proven to enhance energy and improve mental clarity during stressful periods of work or studies. SHR-5 is the only Rhodiola extract with proven efficacy in clinical studies published in international scientific journals. 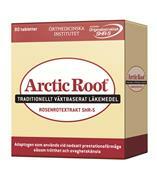 Arctic Root standardized extract SHR-5 is registered as an Herbal Medicinal Product. - Single dose and instant action. - Improves speed and quality of mental work capacity. - Taken regulary, it counteracts mental stress and improves concentraton and memory. Adaptogens constitute a new class of metabolic regulators that have been shown to increase the ability of the organism to adapt to environmental factors and to avoid damage from such factors. These substances of natural origin combat stress induced disorders and increase physical capacity during strain and stress.